The first N64 Zelda game, Ocarina of Time, was a complete reinvention for the series. It was a game that you could pick up, intend to play for an hour, and then not be able to stop for five. It showed that Hyrule was a place that existed in the mind of Shigeru Miyamoto, not just some 2D GameBoy cartridge. It was, and still is, a masterpiece, a game that defied what the world had decided an adventure game should be. The second Zelda game, Majora's Mask, riding in the still-high wake of its prequel, was a game that was innovative, rather than a game that defied the odds. It was more of an expansion pack than a sequel, a game that wasn't very long in it's own right. Where the idea behind the first game was music and the earth, and using those concepts to your advantage, the concept behind Majora?s Mask was much more singular?time. Riding his horse, Epona, after the events of Ocarina of Time, Link is heading to an unknown location through the woods. As might be expected in the mysterious land of Hyrule, there are many, many monsters and bizarre creatures lurking in the shadows. In the forests, however, there is no creature, save one strange group of lost children, imps if you will, called the Skull Kids. One of these children jumps Link, scaring Epona, and knocking Link off onto the ground. While Link is unconcious, the Skull Kid rummages through Link's things, and finds his ocarina, which is the Ocarina of Time, as well as his armor, swords, and the like. After the Skull Kid runs off, accompanied by two malevolent faries, Link awakens to discover that all of his things, save the clothes he is wearing, are gone. He proceeds to follow the trail of the Skull Kid, traversing over some odd areas in the trees, when he falls into a hole. There, Link is transformed, by the Skull Kid, into a little woodland creature, called a Deku Scrub. The Skull Kid then runs off, only to leave behind one of it?s fairies, Tatl, who isn?t too happy to be around Link. However, Tatl makes the best of her unfortunate situation by using Link to find the Skull Kid, and thus reuinting Tatl with the Skull Kid and her brother, the fairy. Link eventually finds a way out of the hole, only to pop into a parallel world known as Termina. Here, he finds many characters that are quite similar to those of Hyrule?s, except with different names and jobs. But he finds out two more things. Link meets the Happy Mask Salesman, from Ocarina of Time, in Termina. The Salesman reports that a Skull Kid stole one of his masks, called Majora's Mask, a mask that was made by a dark cult with great powers of destruction. The mask was used in evil, arcane rituals that possessed it with a great evil. The Skull Kid was also possessed with this evil, and the end of the world will surely come if Link does not retrieve the mask. That leads us to the next problem: the end of the world, namely, Termina. Even though the mask would end the world, events had been set in motion that will surely lead to the destruction of mankind. The Moon is growing ever nearer to Termina, and at the end of three days, the Moon will destroy the realm that Link has fallen into. Not too good. But, you eventually get this ocarina that can turn back time, yeah, the Ocarina of Time. While the graphics certainly are good, they are nothing compared to the grand scope presented in Hyrule. Perhaps this is because the world of Termina is so much smaller than Hyrule. 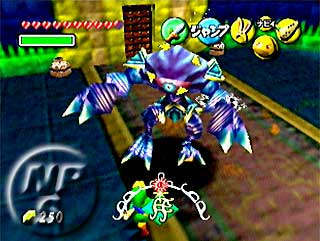 Whatever the case, Nintendo introduced several new graphical elements to Ocarina of Time?s graphics engine. The first was the transformation that occurs when you don a mask. These range from pretty cool to downright disturbing, with some of the best looking effects seen on the N64 until 2000?s Perfect Dark. The next were the amazing boss battles, always fast paced and fierce, requiring a unique strategy that was much different than most of the straight hack and slash battles from the preceding game. Finally, characters and animations were greatly improved. More characters actually moved around the world of Termina, rather than just standing still and dancing. You could catch a character walking home after work, or even going to work, and engage in coversation with them. Unfortunately, even with all the bonuses and boosts the graphics received, they still cannot live up to the magnificent scope and range that Hyrule showed the world. Ocarina of Time had its fair share of challenging, inventive puzzles. In turn, Majora's Mask tries to live up to this unbelievably high standard that the prequel set, and fails where it counts. The most difficult puzzles are the ones that are required to earn Heaart Pieces, but even those can be figured out pretty painlessly. Actually, the game does manage to crank out some brain stumpers later in the game. The real problem here is that Majora?s Mask never truly achieves the flow that Ocarina of Time hit quite early in the game. Combat is the focus of this game, and it shows. Boss battles are replayable, and perhaps most importantly, fun. Enemies are always varied and interesting, and the final boss battle is a challenging foray into a bout with the end of the world. Above, I spoke of innovation being a major part of Majora?s Mask. It is that, but it is also a unique twist to the tried-and-true collect-a-thon that many games employ. The idea is that masks are a form of commodity in Termina. Basically, if you do certain tasks, like defending a ranch from supernatural invaders, you get a unique mask with a truly different function. That is really what Majora?s Mask is, besides being about this strange land called Termina. After you collect certain masks, you can influence the people that affect the storyline, directly or indirectly. Majora?s Mask, while still maintaining the classic Zelda dungeon exploration, is no match compared to the previous, or the most recent, Zelda games. The story is not all that engaging, the game play is way too easy, and there are no truly difficult puzzles to speak of. When the only puzzle in the game that makes you repeat it is a maze, you know that there is something wrong. Still, astute players will see that The Wind Waker?s concept was in the making here. Again, the highlight of the sound is the grand orchestral score, not the absent voice acting. It makes the player wonder when, exactly, Nintendo will switch to full voice dialogue. I don?t know about you, but just reading line after line of text can get kind of boring in an action-focused game such as this. Hopefully, the developers will spend just a little extra cash to get voice actors. Until then, this is the best we can hope to get. No video game in recent memory has had the excellent control that the N64 Zelda games had. The control system is used in games today, and will be for years to come. Truly excellent controls. Here?s the big problem with Majora?s Mask. The appropriateness. The Mask is inhabited by a demon, there is a mask called the Fierce Deity Mask, which turns Link into a sort of demigod. Other than those problems, Majora?s Mask is an excellent, truly quality game, if not a little repetitive and lackluster in story. Majora?s Mask deals excessively with demonic possession and the dark side of the spiritual war. Despite the fact that it is, yet again, a triumph of game design, Majora?s Mask is not a game I, personally, would recommend for a Christian to play. Parents, please do not let your kids play this game. It is EXTREMELY dark.